Getting in the car or on a plane for a summer vacation may be routine today, but around 1900 most people could only experience the wonders of the world beyond their immediate environs through photographs. Stereo cards were a very popular way to learn about the world "outside". This week we'll take a quick tour of the world through a small sample of the many stereo views in our collection. Most of the country learned about Yosemite from photographs like this long before it was possible for most people to visit. 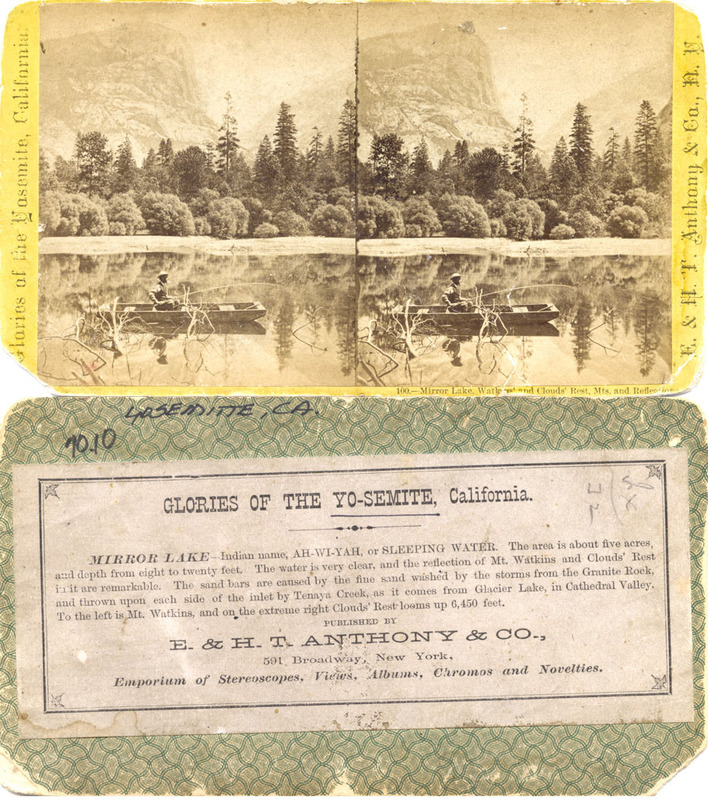 It is said Carleton Watkins photos of Yosemite were critical to forming the national park. Carlton Watkins left such a legacy in his photos, though his life ended in such tragedy. He took all the stunning photos of Yosemite and also did other photographic work for many. Yes, you might say he was the "FATHER" of Yosemite, as it is now seem by millions. In the 1890's his eyesight started to fail and it got to the point he could no longer work. There was a time, due to the fact of no money with which to properly house himself, his wife and two children that they lived in an abandoned railroad car. His died in 1916 in the Napa State Hospital in California. He had finally been put in the care of his daughter where he had remained for about a year before finally ending up in Napa State. I should have been a little clearer that this is not a Watkins image, but it is an image of Mt. Watkins. Mt. Watkins was named in honor of Carleton Watkins and his role in preserving Yosemite. When I was little, we had two boxes of stereo cards and a viewer. I can remember siting on the floor and looking through them. I have no idea what happened to them and I can't really remember what the photos were. L.E., my recollection was sitting with my cousins and a box of Viewmaster disks. I wonder if we have any in the collection? I think Scott Cook has the "Lassie on the flume" Viewmaster disks! I donated a Viewmaster plus a few disks to the museum. Among them, Lassie at the Flume. Too bad Viewmaster had to go out of business.